With cooler temperatures, the docks were busy all weekend. 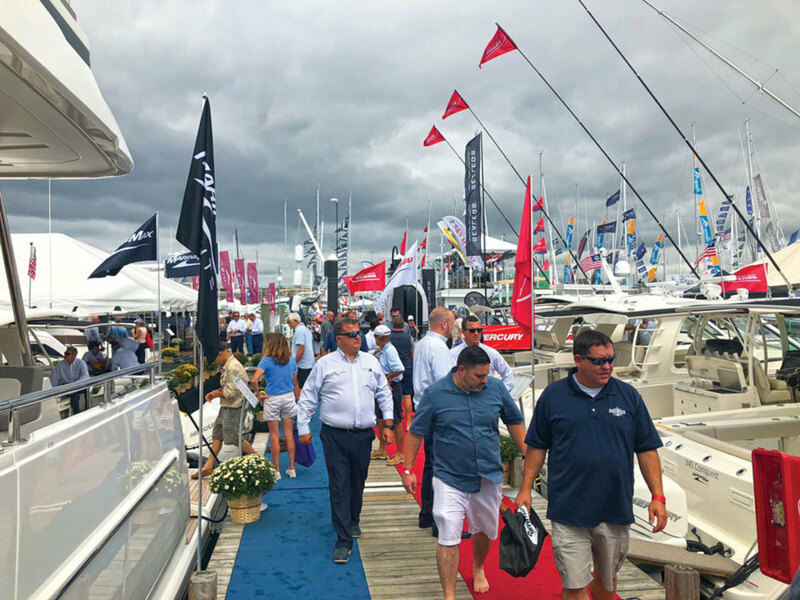 The Newport International Boat Show, which ran Sept. 13-16 on Commercial Wharf in Newport R.I., drew crowds during a break in the heat that New England had endured for most of the summer. Organizers don’t give attendance numbers, but this year’s show included more than 400 boats in the water and 600 exhibitors. Robin Brendle, annex sales manager for HCB Center Console Yachts, says the new annex in Staten Island Yacht Sales provided an impressive lineup of boats. “It was fun to watch the jaws drop and hear the comments when customers walked up to the 53 Sueños,” Brendle says. “I had a number of customers tell me they thought it was the hit of the show. EdgeWater Power Boats’ northeastern regional sales manager, Jay Bentley, says the company gathered solid leads at the show. “The weather was perfect, and the traffic was heavy, with the exception of Thursday’s washout,” which largely took place before the show opened, Bentley says. Boston Whaler doubled its unit volume sales compared with last year’s show and quadrupled dollars versus the 2017 show, says East Coast business manager Doug Nettles.